Naturally a teacher, Mel Fleming has a clear concise and encouraging style of teaching and her passion for horsemanship is clearly demonstrated in her training. She has a diverse range of skills with many years of experience in starting horses under saddle, solving behaviour problems with difficult horses, developing competition and performance horses, equine postural training and rehabilitating horses that are broken in body and spirit. Mel has competed successfully in dressage and jumping and in 1990 represented Australia at the World Equestrian games in vaulting (gymnastics on horses) and although not a competitor in Western disciplines she has had experience in those areas also. Mel began her professional career with horses at age 17 as a trainer and competitor, starting young horses, showing dressage and jumping horses and driving harness horses. She studied with the some of the best trainers all around the world, many being International representatives of their sport in both English and Western disciplines. Mel became accredited with Equestrian Australia (EA) as an instructor in the early 90’s and then in search of answers for problematic behaviours like bucking, rearing, trailer loading problems or handling challenging stallions, Mel turned to natural horsemanship and studied and worked for twelve years with Pat and Linda Parelli, becoming one of their highest rated instructors and horse trainers. Her horsemanship learning did not stop there, but continued to evolve. Other mentors and teachers included Ronnie Willis, Carol Brett and Lesley Anne Taylor from Balance International (teachers of Equine Biomechanics and makers of the BALANCE saddles), Tony Robinson (Universal Energetic Mind and Bodywork) and Gavin Scofield (Equine Osteopath and teacher of Equine Biomechanics). Mel has also been strongly influenced by Alexandra Kurland’s clicker training and positive reinforcement training philosophy. A student of the martial art Aikido and many years of experience with the Feldenkrais Method (Awareness through Movement) have taught Mel much about energy and fluid, balanced, biomechanically correct movement, all qualities which are deeply embedded in her work with horses and riders. Today, the horses themselves are her biggest teachers. 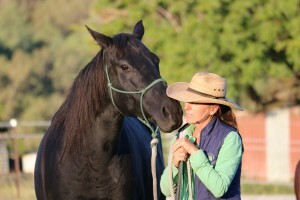 Mel is very down to earth, and has now developed her own unique approach to horsemanship which she calls “Connecting with Horses & Riding with Synchronicity”. She helps people to understand the horse’s mind, emotions, body and spirit. In particular, there is an emphasis on the connection to the spirit and the individual personality of the horse and the correct balance and biomechanics for horse and rider. The focus is on positive reinforce rather than negative reinforcement, which creates and keeps willingness, enthusiasm and exuberance in the horse. This leads to the development of safe, calm, confident, willing partnerships with horses and top quality performance.